This is a great example of a promo that really hits the mark with its target audience. 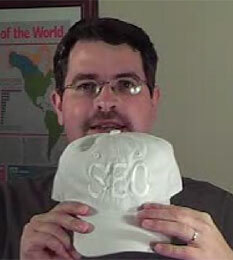 First, it’s a play on the industry term “white hat” which refers to legitimate search engine marketing, but also uses a tone-on-tone embroidery on the cap to make another inside joke, because search engine spammers use text in the same color as the background of the page to stuff keywords onto a page that human users won’t see. At any rate, it was clever enough to warrant a cameo in one of the videos Matt Cutts from Google put on line to clarify some of their quality control practices.